"Received my order very quickly. It was a great experience ordering from you and will do so again very soon. Thank you so much. Love the coffee cakes they are wonderful. Thanks again!" Larger version of our My Grandma's blueberry coffee cake. Fresh New England blueberries and pure New England maple syrup are mixed into the traditional rich sour cream coffee cake batter. Walnuts are not added to this popular blueberry coffeecake. The three pound coffee cake serves approximately 16-20 and can be frozen up to four months. Kosher Certified and contains no trans fats, artificial flavoring, artificial coloring or preservatives! We're delighted to offer My Grandma's Blueberry Coffee Cake in both regular-size and large-size cakes! Sometimes even the best morning rituals need some variety. We have improved on the unbeatable food and drink combination of coffee and coffee cake by offering you the only thing better then your regular plain coffee cake: coffee cake with blueberry. It is bursting with fresh fruity flavor, chock full of blueberries and complimented with maple syrup to add some excitement to a traditional sour cream coffee cake batter. Our blueberry coffee cake will freshen up your routine as well as your excitement for this perfect brunch and breakfast favorite. Great for a breakfast snack, great for brunch, it�s easy to see why this cake is such a favorite. The cake itself is soft and fluffy and the blueberries are sweet with just a touch of tartness. It�s delicious served warm or cold. Some people like their blueberry coffee cake with vanilla ice cream, but we think it�s just as good plain. All of our cakes have no artificial coloring, artificial flavoring, or preservatives. 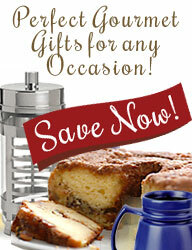 Coffee cake with blueberries also makes a great gift�and it�s perfect for entertaining. Once you try it you�ll never feel the same way about coffee cake again! Burstin' full of bouncing blueberries! Our CoffeeCakes.com Blueberry Coffee Cake adds fresh blueberries and maple syrup to a traditional sour cream coffeecake batter to create this coffee cake you have to taste to believe. Try one and find out why it's a brunch and breakfast favorite! Our CoffeeCakes.com Blueberry Coffee Cake adds fresh blueberries and maple syrup to a traditional sour cream coffeecake batter; walnuts are not added to this popular blueberry coffeecake. Our CoffeeCakes.com Blueberry Coffee Cake is trans-fat free and does not contain any artificial coloring, artificial flavoring or preservatives! It makes a great gift for giving and entertaining! This one-pound twelve-ounce coffee cake serves approximately 10 - 12 and can be frozen up to four months. Find out why this coffee cake is a brunch and breakfast favorite!